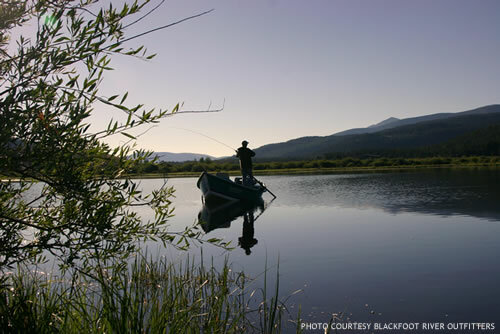 Georgetown Lake is one of Montana’s premier blue ribbon fisheries offering nearly year round angling for trophy rainbow and brook trout and kokanee salmon. With an average depth of 16 feet, the lake is relatively shallow and much of the lake bottom is weedy providing excellent cover for the fish and habitat for the insect larva, aquatic insects and the fresh water shrimp that make up a large part of the trout’s diet. Self-sustaining populations of trout are supplemented each year with stocking. In 2008, the last year of complete data, the lake was stocked with approximately 275,000 rainbow trout and 168,000 brook trout. 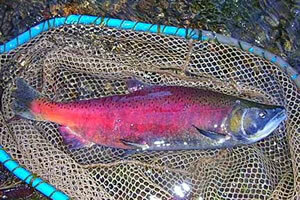 There are two main types of rainbow trout, the faster growing Arlee and the better reproducing Eagle River strain. The average rainbow trout size is close to 14 inches, brook trout averaged about 12 ½ inches and kokanee salmon averaged over 9 inches. 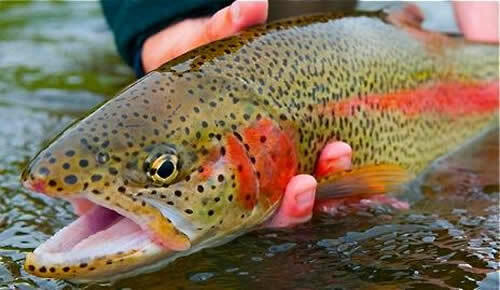 Rainbows can weigh over 10 pounds and 5 pounders are not uncommon. Brook trout can grow as large as 5 or 6 pounds with many in the 2-pound range. Anglers have also caught the occasional lake trout up to about 20 pounds, however these are most likely flushed from the deeper Silver Lake. Also in the lake are longnose suckers, redside shiners and the rare westslope cutthroat. The lake is open from the 3rd Saturday in May until March 31st. From April 1 through June 30 fishing is closed from a point 200 yards west of Denton’s Point Marina to a point 200 yards north from the mouth of the North Fork Flint Creek including all of Stuart Mill Bay. There is no fishing between the shore and 100 yards out. This is a great time to observe large rainbows spawning along the shore, in tributary streams and at Emily’s Spring, a pond that is opposite the eastern shore about mid-lake. During the spring, summer and fall, fishing with live bait, night crawlers and maggots as well as power bait, works well. You cannot use live baitfish, but you can fish frozen or dead redside shiners and other bait fish, which are a major food source for the trout. There are various fishing methods using bait, but a popular method is to float or suspend bait about a foot off the bottom. One angler injects air into a night crawler so it floats a foot above the sinker. Bait is usually cast out and allowed to sit, though retrieving the bait can often prompt a strike. In late summer and fall kokanee salmon, in preparation of spawning, start to school near the Pump House on the Eastern shore of the lake and near Denton’s Point on the South shore. Jigging a kernel of corn with maggot or two behind on a glow hook about 4 turns or 1 to 2 feet off the bottom is the best method to take salmon. If the bite is on it is not unusual to take as many as a 100 salmon or more in a day. Spinning tackle can be effective particularly in the early spring just after ice off and before the weeds have started to grow, though these lures will work throughout the season. Among the lures that work well are Thompson’s spoons, Panther Martins in a day-glow orange or chartreuse and Rapalas. Fish lures along the shore and along weed beds. Another method is to use a jigging lure, such as a Swedish pimple, orange and chartreuse, fished just off the bottom occasionally jigging the lure 18″ to 22″, then allowing it to settle back. Spinning lures, particularly those with treble hooks, can be problematic. Hooked fish tend to dart into the dense weed beds where the hooks become hopelessly entangled and the fish and lure can be lost. Many spin fishers prefer to use flies, discussed in the next section. A bubble, half filled with water, is threaded onto the line through a tube in its center. A swivel is tied on to prevent the bubble from slipping off and then a 4-foot leader with a fly is tied onto the swivel. The weight of the bubble allows the fly to be cast. 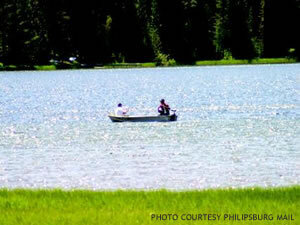 Georgetown Lake has a diversity of aquatic and insect life and, while bait and spin tackle work well, the Lake is best known for its excellent fly-fishing. Rainbows, and to a lesser extent brook trout and kokanee salmon, readily takes flies of every sort including streamers, nymphs and dry flies. Though there are many hatches that occur during the spring, summer and fall, three are highly anticipated. The callibaetis mayfly (speckle duns) makes an appearance starting in early June and continues to hatch through August, or even into September during warmer years, but the fishing is best starting in July. Nymph patterns, which include pheasant tail and hares ear, are cast next to weed beds or toward shore, allowed to sink close to the bottom, and then slowly retrieved into deeper water or along the weeds. Another method during windy days is to drop a nymph or two from a long leader below an indicator and allow the action from the waves and wind to entice a strike. Some of the adult dry fly patterns include parachute adams, purple haze, green sparkle dun, callibaetis comparadun. For spent flies there are the callbaetis spinner and the hen spinner and for emerging flies or flies stuck in their shuck there is the callibaetis cripple. Dry flies can be cast out and allowed to sit, though an occasional twitch or even a slow retrieve can sometimes entice a strike from a reluctant fish. Sizes tend to be larger 14-16 in the early season dropping to size 18 later in the summer. One of the most popular hatches, damselflies, begins around late June and will often continue, depending on the weather, through August. The adults hatch from about mid morning until about noon. The best time to fish is just prior to a hatch using nymph patterns such as a green marabou damsel, a small green wooly bugger, a green wooly worm with a red tail and other nymph imitations 8-12. Flies can be cast out, allowed to sink and then slowly retrieved. When the adults start to hatch, try an emerger or an adult pattern. Cast the fly out near weed beds and allow to sit, or try to put it in the path of a sipping fish. On warm afternoons and evening, starting about mid to late June and lasting until about early September, a large Georgetown Lake Caddis, the Traveling Sedge, make an appearance. This particular caddis species are so large that they are unable to take off from the water and must skitter, like mini motorboats, to the shore, making them an enticing target for large cruising rainbows. Imitations include large goddard caddis, elk hair caddis and orange and yellow stimulators all in a size 4 to 10. Fishing is best when there is a light chop on the surface. The best method is to cast the fly into the wind and use a fast retrieve back with the wind. Some people even put the rod under their arm and use two hands to get a faster retrieve. For caddis pupas try a sparkle pupa, soft hackle, zug bug or a Z wing caddis. Another excellent group of flies are leech imitations. Marabou or rabbit strip leech patterns in brown, olive and black, are allowed to sink, then are very slowly inched along the bottom. Although not popular, sow bugs or a small fresh water shrimp pattern might also be effective. During windy afternoons in late July through September try a terrestrial such as an ant, beetle or moth. When all else fails try a Carey special or a sheep creek inched on the bottom or suspended from an indicator as a searching pattern. In the fall, when the brook trout are spawning, streamers in various colors produce numerous strikes, and can land big fish, some as large as 5 pounds. There are some who feel that fishing over spawning beds is unethical. If you do fish during the spawn it is recommended that you use barbless hooks, handle brook trout gently and try to release them quickly and without removing them from the water. During this same period egg patterns can work well for the kokanees and rainbows. Trailing the egg behind a streamer with a medium retrieve seems to be the most productive, though the eggs can be fished alone. 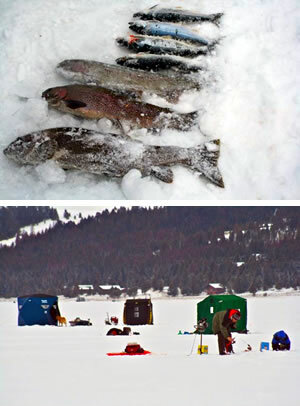 Because Georgetown Lake is relatively shallow, ice forms and fishing begins earlier than many of the other Montana Lakes. Fishing is best in December, early January and again in March, though there are great fishing days to be had throughout the winter. The preferred method for both trout and salmon is to use two maggots on a glow hook, one to two feet off the bottom, jigging the line up and down occasionally. Some people use a Swedish Pimple or other jigging fly with a glow hook and maggots dropped beneath it. Usually the take is very subtle, particularly with the kokanee salmon, so you have to be ready to set the hook. Rainbow Sporting Goods – 605 E. Park Ave. (406) 563-2662. Echo Lake: From Route 1, about half way along Georgetown Lake, turn NW onto Southern Cross Rd. After about ¾ mile, bear left onto Echo Lake Rd (toward the ski hill) then go about 2.2 miles and make a left at the sign toward the lake. Follow road around Lake to the Western shore where there is a public access that has picnic tables. Like Georgetown Lake there are probably callibaetis and damselfly hatches, but also try crayfish imitations, as there are reports that these tasty crustaceans populate the lake. 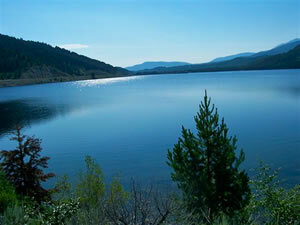 Silver Lake: is 1.5 miles east of Georgetown Lake on south side of Route 1. The only public access is from the highway down a steep bank and there are no public boat launches. There are a number of species of trout that will take many of the same flies and lures as Georgetown Lake. There are also large lake trout. One regular Silver Lake angler claims he is broken off using 15-pound test line on a regular basis. If you can get access, lake trout can be fished by trolling with down riggers with baited lures. Pork rinds work well. 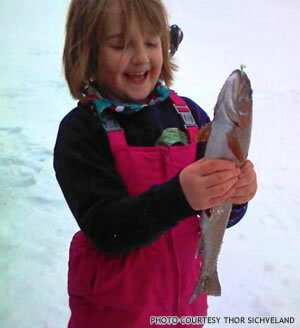 Though less popular than Georgetown, Silver Lake has good ice fishing for lake and other trout. Racetrack Lake & Fisher Lake: (*Note – you will probably need a jeep or 4-wheeler to get to this lake.) From Route 1, about half way along Georgetown Lake, turn NW onto Southern Cross Rd. After about ¾ mile bear left onto Echo Lake Rd (toward the ski hill) then go about 2.1 miles and make a right onto Cable Rd, also known as County Road 242. On the left is a parking area. This is a good place to unload your 4-wheeler. Take Cable Rd for about 5.5 to 6 miles to where it becomes a rough jeep trail. Take jeep trail and bear left after about ¾ miles to Race Track Lake or right to get to Fisher Lake. Both are about two miles from the improved road and are in beautiful settings, perfect for a picnic. Small nymphs, mayfly and caddis patterns tend to work well as do terrestrials during windy afternoons. Fish are not overly selective if they are biting. 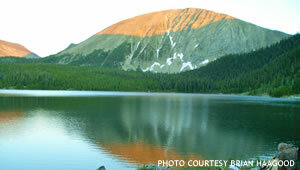 From these two lakes you can access dozens of other alpine lakes by 4-wheeler or hiking. Little Racetrack Lake can be reached by hiking about a ½ mile southwest from Racetrack Lake. Southeast from Fisher you have the Meadow Lakes and from there you can hike south to Big and Little Pozega Lakes and Green Lake. Going northeast you have Dead Lake, Abicaulis Lake and Alpine Lake. From Race Track Lake you can go northeast to Mud Lake or northwest to Crystal Lake, Copper Lakes, Dora Thorn Lake and Sidney Lake. Many of these lakes have populations of cutthroats and occasionally other trout and most provide excellent fly-fishing in mid to late summer. Check maps for specific directions. East Fork Reservoir: Off of Route 1 turn West onto Georgetown Lake Rd, past Dentons Point to the Southwestern tip of the lake. Bear left and take County Rd. 672 for several miles to stop sign. Make a left onto East Fork Rd. and take to the reservoir. East Fork has excellent fishing for large cutthroats and a rare rainbows, as well as bull trout, which are protected and must be released. Bag limit for cutthroats is 3 fish. Anglers use bait, spinning lures, (spinner baits work well) and flies. Some of the best flies to use are damselfly nymphs, in the evenings callibaetis imitations, such as a parachute adams, and wooly buggers. You can also try black gnat and black ant patterns. Though sometimes hard to get to in the winter, there is excellent ice fishing using maggots and mousies (a maggot like grub with visible legs) on a glow hook. There is a campground with 10 tent sites at the lake. Storm Lake: Take Route 1 East from Georgetown Lake. Make a right at Storm Lake Rd. Follow Rd. bearing left at all forks. Go about 9 miles to lake. The road for last mile or so is very rough and, while regular cars do make it to the lake, it is most suitable for 4 wheel drive vehicles. This is a stunning setting and in the mid to late summer there is some excellent cutthroat fishing with fish as big as 14 inches. The fish will take small may flies such as parachute adams, and small elk hair caddis, both size 14 to 18. Nymphs can work well as will terrestrials during windy afternoons. You can fish from shore. You can easily walk around the entire lake which is also an excellent short hike, or use a float tube, pontoon boat or canoe. There are informal campsites along the western shore. From Storm Lake you can take a rigorous hike up the Storm Lake Pass, over Goat Flats and down to either Upper Seymour or the Page and Flower Lakes. 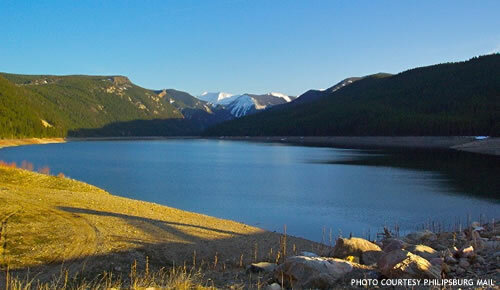 Twin Lakes & Fourmile Basin Lakes: (*Note – both lakes can only be reached by hiking) Take Rt. 1 east from Georgetown Lake. Make a right at Twin Lakes Rd. Take road to end. Trail to left leads to Twin Lakes (about 3.5 miles), to the right leads to Fourmile Basin Lakes (about 3.25 miles). 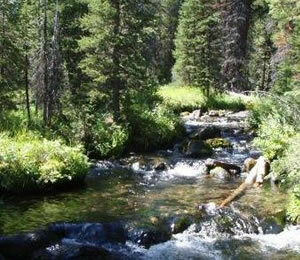 Both are beautiful settings with good cutthroat fishing starting in mid to late summer and into the fall. Mayfly nymphs, small mayfly dries and terrestrials work well. Stewart Lake: Take Route 1 north. Turn right onto Broadway toward town of Philipsburg. Go into town and make a left at Montgomery St. (past bank). Proceed about 2 miles and make a right onto Stewart Lake Rd or County Rd. 8445. Take for 2.25 miles to the lake. There is good fishing at Stewart Lake using many typical mountain lake flies such as small may fly nymphs and dries and terrestrials. Directions: Flint Creek flows out of the northeast corner of Georgetown Lake from the dam and then parallels Hwy. 1. Much of the river is private but you can fish along the river at Flint Creek Campground and at bridges. Many of the ranchers will also let you fish their land if you ask permission. Some of the best fishing is in the fall when the large browns come up the creek to spawn. Directions: Take Hwy. 1 west. Turn left at either at 38, Skalkaho Rd. or just past the Sunshine Station at 348. Take these roads about 15 miles to Rock Creek. Turn either direction onto Rock Creek Rd. There is public access all along its length. You can float and fish the river in the spring until July 1st. This is one of the best and most beautiful freestone rivers in the state. 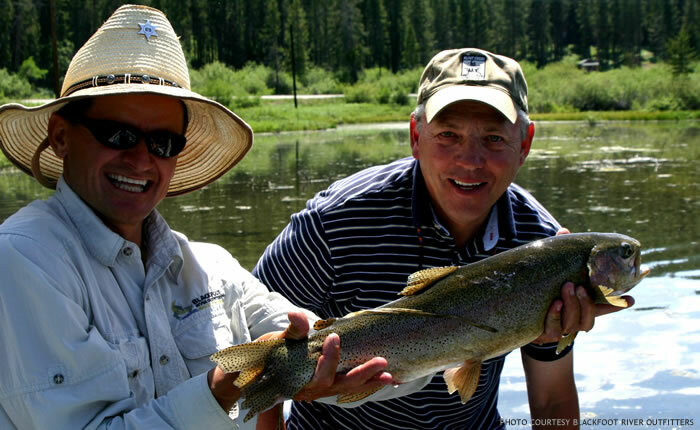 There is excellent fishing for cutthroats, browns and the rainbow populations are improving. There is also whitefish and bull trout which are protected and must be released. Directions: Take Hwy. 1 East past Anaconda. For the upper river turn right on Mill Creek Road. There will be a sign that says to Wisdom. Take the road to the end, approximately 24 miles. Turn either direction. For the middle and lower river get on Interstate 90 west toward Butte. Exit onto the 15 south. Exit at Divide, Moose Creek, Melrose, or Browns Bridge. Follow service Rd. in either direction. 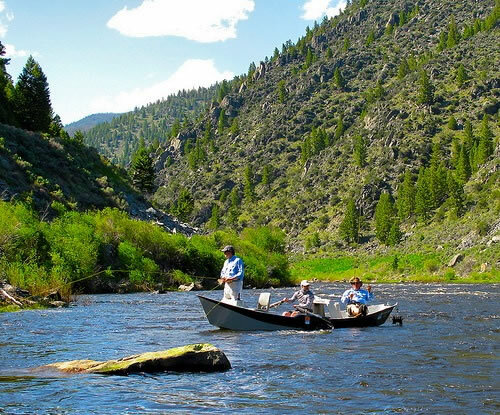 The Big Hole has some of the best fishing in the state along most of its entire length. 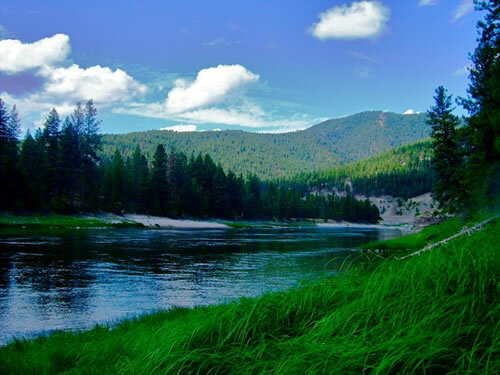 This freestone blue ribbon fishery has a diversity of insect life and produces good numbers of browns, rainbows, brook trout, the occasional cutthroat, white fish and the only river population of the arctic graying in the contiguous 48 states. There are many public accesses for both wade fisherman and for floating. 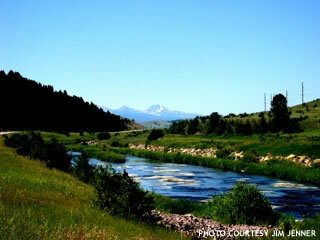 Directions: The upper Clark Fork River can be accessed from Warm Springs Wildlife Refuge. Take hwy. 1 past Anaconda. Make a left onto 48. Take to end of road and make a left, then make your 1st right and go into parking area. There is also good fishing in some of the tailing ponds with big fish. Check regulations as some of the tailing ponds are for children only and none of the fish from the ponds are safe to eat. The Lower Clark Fork can be accessed from the 90 East which follows the river. Directions: Warm Springs Creek flows from the mountains accesses on Warm Springs Rd (Hwy 1 east, look for sign on left and access campground of picnic area) down along Hwy 1, (though much is on private land the river can be accessed from several bridges and side roads) through Washoe Park and over to Warm Springs where is flows into the Clark Fork (see directions to the upper Clark Fork. 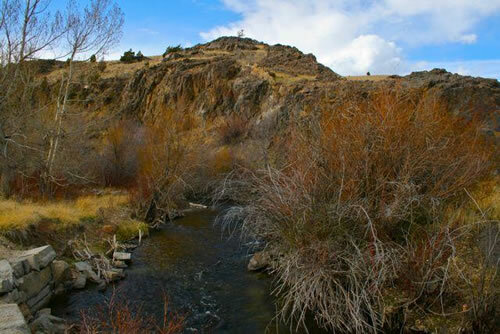 Lower Warm Springs can be accessed across from Clark Fork and also from public land belonging to the Warm Springs Psychiatric Hospital). Directions: Take Hwy. 1 West past Philipsburg to Maxville turn off. Make right and follow road through Maxville. Much of this small pocket water fishery is on private land, but there are several public accesses. Most of the fish are smaller cutthroats, but there is the occasional larger brown that comes in the spawn or feed. Directions: Take Hwy 1 West. Make a right turn at Rumsey Road. There are a few public accesses along the way. At the end of Rumsey Road you can hike along the creek into the mountains. Fred Burr Creek flows out of the Fred Burr Lake (Philipsburg’s water supply and closed to fishing) and has some good pocket water fishing for small cuts and probably brooks. 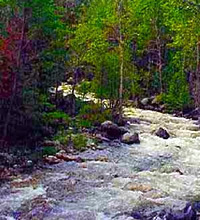 It is one of hundreds of typical small Montana creeks that flow out of the mountains and provide beautiful scenery and challenging technical fly-fishing. Higher upstream some of the fish have a deep golden color and may be golden trout or golden hybrid. Directions: N. Fork Flint Creek flows out of the mountains and into the Eastern shore of Georgetown Lake. Much of the lower section of the creek flows through willow swamp and dense woods making fly-fishing nearly impossible, though spin fisherman might have better success. 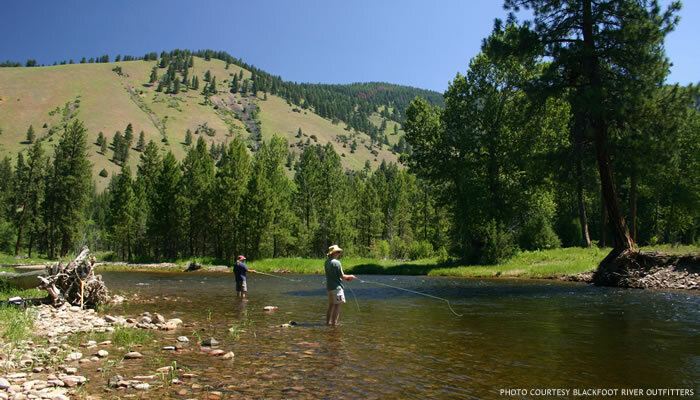 Better fly-fishing can be had further upstream. Make a right on Southern Cross Rd. and follow signs toward Ski Hill. Make a right toward the Cable Creek Campsite just before the Ski Hill entrance. Follow the road past the mountain. The Creek flows parallel to the road. Much of the creek here is on public land and produces decent brook trout, particularly in the fall when the larger fish come up to spawn. Directions: Hwy 1 East. Make a right at sign for Storm Lake Rd. The Creek parallels the road. There is some pocket water fishing for cutthroats. The fishing tends to be tight and technical and a shorter rod is recommended. Directions: Hwy 1 East. Make a right at sign for Twin Lakes Rd. The Creek parallels the road. There is some pocket water fishing for cutthroats. 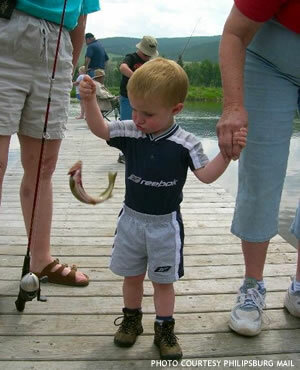 The fishing tends to be tight and technical and a shorter rod is recommended.